Step 1: From the Homepage Click New Visit. Step 3: Select the Start Date or when you like Visits to start being generated from. Step 4: Enter the End date, we normally suggest entering in 12mths worth of visits. It's really simple to extend Visit Schedules later, and the app tells you when you have expiring Visit Schedules. Step 5: Add the Visit Start Time and End Time. If you have two employees and the Visit is for 4 hours per day, set the visit as 2hrs. If you don't really have any fixed times, that's fine add the perfect world scenario or that latest possible times the work can be performed. Step 6: Then we need to enter the Visit Name. The Visit Name will be used across the app to reference this group of visits and also by your staff in the field to also identify their jobs. Step 7: Scheduling in your Visits is the next and most IMPORTANT Step to understand. 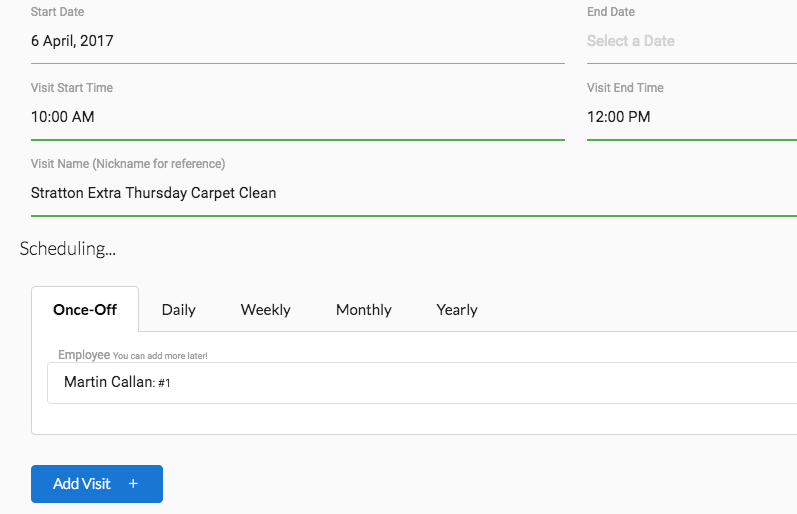 A Visit Schedule is like a re-occurring event in your calendar, however freshOps has some further scheduling features that most calendars do not. Step 8: Once you've selected the Frequency Click ADD VISIT. Your Visit Schedule will then appear on the right hand side column, like so. 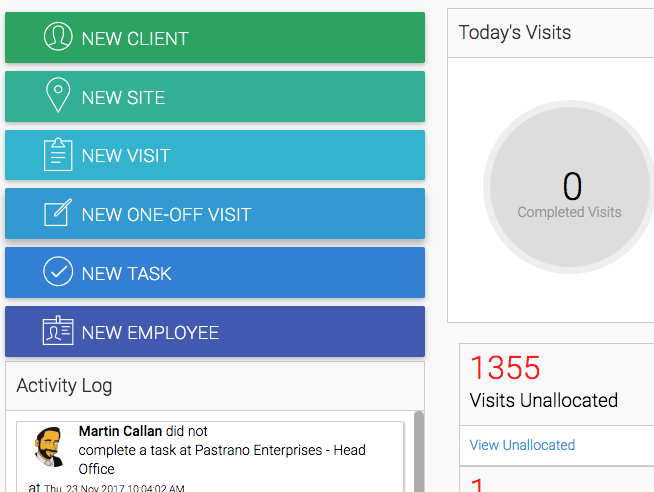 Option 3: Unmark the Take Me to Create Tasks option and just create the visit and return to the dashboard. The End date is the date the Visits will cease. Many users have Contract that are 1, 2, 4 or even 5 years, so this will obviously dictate your end date, however, if you don't use contract periods and operate on a monthly or even a per service basis, we suggest creating a year worth of visits in the system. If you do have really long contract such as 5 years, it's important do understand, that freshOps will create a visit for the next 5 years. This could be in excess of 2000 visits in the system, for just 1 Client, if you have 100's of clients the amount of visits can increase to enormous amount. While freshOps can more than, handle this volume, it's always good practice to keep the system nice and lean. So we still suggest limiting the period to 2 years., This is also great practice, so that you can review details every 2 years. Once Off Visits are for when you need an isolated visit. An extra clean, a carpet clean or a QA visit. From this screen, you can Allocate the Employee required. You don't need to add an End Date, just enter the Start Date, which is the date the Once Off Visit is required. Every Day - which is as the name suggestions is every day/7days a week. 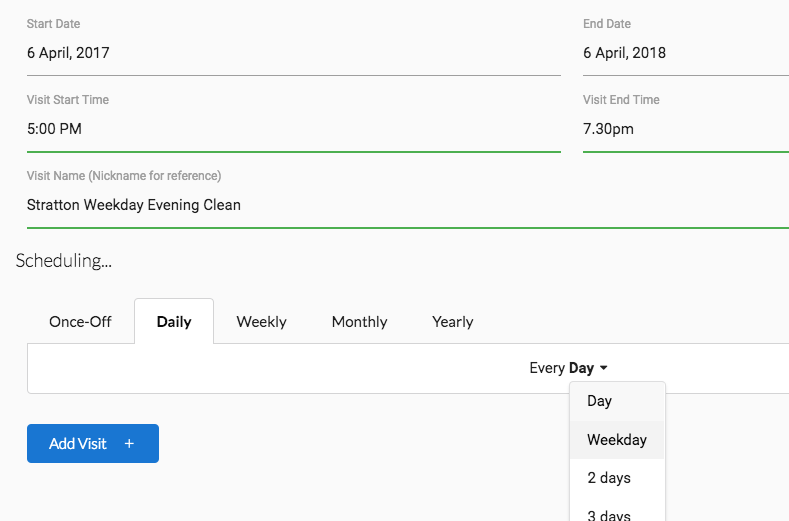 Every 2 Days - this maybe of great use if you service a site every 2nd day, or if you have two staff servicing a site on a rolling roster (one day on & one day off), create two schedules both with Every 2 Days selected and give them staggered start dates. 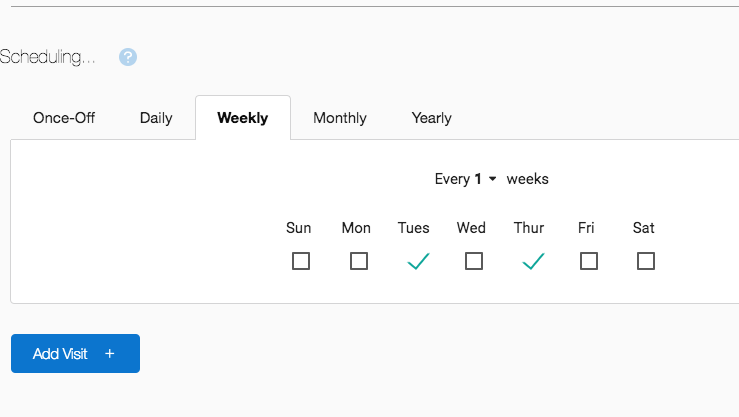 Choose the days and then select every x amount of weeks from the dropdown. Weekly will be every 1 weeks, Fortnightly will be Every 2 weeks. We also have included some industry presets available. 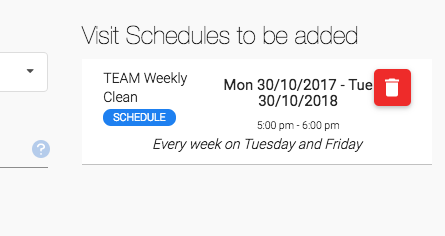 Often in the cleaning industry, you may have a visit schedule as displayed above, however, sometimes the Friday may be a longer clean or have a later start time. There are multiple ways to manage this. Create the Monday and Wednesday as 1 Visit Schedule and create the Friday as it's own Visit Schedule. Or, you can create the 3 day per week schedule for the times that the Monday and Wednesday are scheduled for, then once all created you can edit the Start and End Times of just the Friday Visits as outlined here. Or Annual Services that essentially have their own Task Lists, Or completed by other Staff, or even external Contractors. NOTE: In the Example above, the 3rd of April, is in fact, the First Monday of April. The start date, must match the scheduling. There are plenty of options here on scheduling these Monthly Items, that should be fairly familiar if you use a digital calendar.